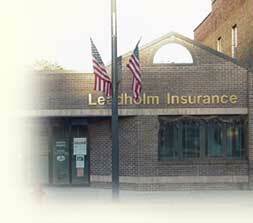 At Leadholm Insurance Agency, we are dedicated to our Mission Statement. We continually attempt to meet or surpass its criteria and all that it demands from us. Although we feel that price is important when purchasing insurance, service and quality coverage are also key elements when deciding on insurance. This combination of price, service and quality coverage allows us to stand apart from the competition. As an independent insurance agency selling for many different companies, we search for ways to reduce the overall insurance costs for each of our clients. Our agency is full of experienced and qualified professionals who can service the clients immediate needs. Our service is one of the key elements of our insurance business. With the numerous insurance companies that we sell for, our agency provides the client with a company that meets their specific needs.